In 1997, a group of mothers of young girls in western Massachusetts gathered to address the challenges of mothering adolescent daughters in today's world. Among us were a family therapist, a high school guidance counselor, a psychiatrist, three teachers, a community organizer, a health professional, and an artist. We were determined to come up with a plan that would enable our girls to thrive through adolescence, that would help us to remain close and connected with them, and that would support us as mothers and as women. We began by reading Mother-Daughter Revolution (1993) by Elizabeth Debold, Marie Wilson, and Idelisse Malavé, a groundbreaking book that encourages women to join with each other in mothering their daughters while challenging the common expectation of mother-daughter separation. Starting with monthly mothers-only discussions, we explored our own experiences of adolescence and our relationships with our mothers, and brainstormed ways we could stay close to our daughters as we nurtured them - and ourselves - through their teen years. Together we came up with the plan of creating a small, supportive community - an extended family of committed mothers and their daughters-in which mother-daughter connection was the norm. 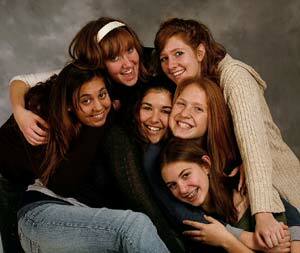 Banding with our daughters, we created two ongoing mother-daughter groups that met regularly, grouping girls of similar ages. We developed playful but powerfully effective activities that fortified our girls' self-esteem as they explored key issues with us, such as girls' friendships and puberty when they were young, and more challenging subjects, such as body image, drugs, sexuality, and violence against women, over time. As they matured, we marveled at the strength and confidence with which they thrived through adolescence, and found that our groups did indeed provide an antidote to the perils of teen culture. 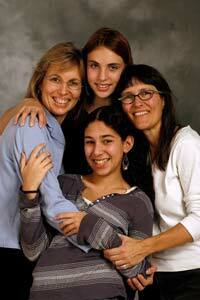 We also learned that it was possible for mothers to have warm and loving relationships with our teen daughters. Equally important, our mothers-only group offered us the sustenance we needed as mothers to navigate our daughters' adolescence with integrity and grace. Five years after we started, when two of the original mothers' younger daughters reached age six, we started a third mother-daughter group, which named themselves the Butterflies, inviting in more mothers and their six and seven year-old-daughters. One of our original goals was to share any ideas we discovered that might be helpful to others. Starting in 2002, we, SuEllen Hamkins and Renée Schultz, two of the founding mothers, have been writing and presenting workshops to mothers, psychotherapists and other professionals about The Mother-Daughter Project, first in the U.S., then around the world. Mothers have been thrilled to hear that they can stay close with their daughters and get the support they need to do so, and mother-daughter groups have sprung up all over the world. Women asked us to write a book about the Project so that they can have more support and guidance, and so, with the blessing of the other mothers and girls in our group, we did: The Mother-Daughter Project: How Mothers and Daughters Can Band Together, Beat the Odds, and Thrive Through Adolescence, published by Penguin in 2007. As our daughters reach adulthood, we are turning more of our energies toward helping other mothers and daughters connect with each other and create the communities in which they can thrive. If you would like to share your story of mutual mother-daughter thriving or what your mother-daughter group is up to, we would love to hear it!